Our blog packages enable clients to have a number of posts delivered at regular intervals every month. They are ideal for those who struggle to find the time, or inspiration to blog regularly. The first step in creating a package is to enter your requirements and billing details. 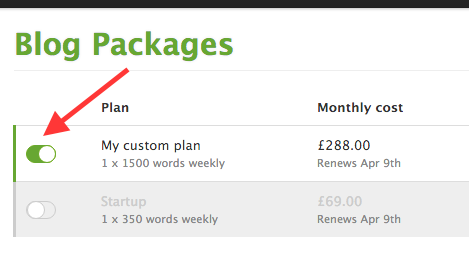 Package plan - select from the 3 default options 'Startup', 'Business' and 'Premium'. If you need to add a custom plan, please refer to the section below. Blog URL - This is the web address where your blog lives. On most sites this will be domain.com/blog. This is used as a reference for your blog writers, and to ensure we don't cover the same topic more than once. Auto publish - Check this box if you'd like us to push your posts live automatically for you. If you'd like to review them first, leave this unchecked. For this option to work, you must have already installed and configured the Copify WordPress Plugin. Subject - Choose the subject that best matches your blog - this will help us to identify the best writers. Keywords - If you have any keywords that you'd like us to include, add them here. Each post will contain one or two of your selection. Additional info - Tell us what you are hoping to achieve from your blog and what sort of posts you are looking for. 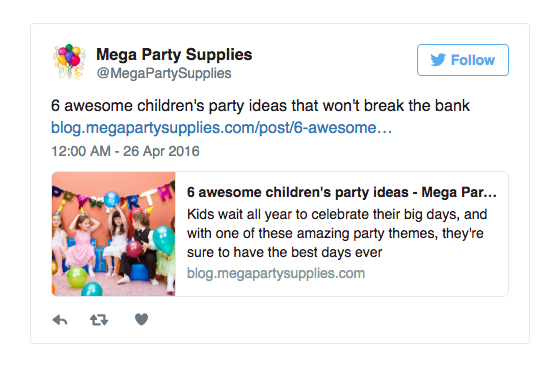 You can also include links to blogs you like the style of. 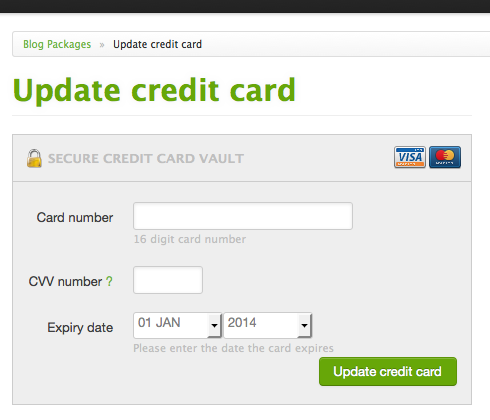 Once you have completed this form, you will be taken to a billing page, where you can enter your card details securely. The above details can be changed at any time from Blog packages -> Edit. Changing these details will automatically update any orders that are scheduled, provided you check the box marked 'Update scheduled' at the bottom of the form. If not, it will update the orders from the beginning of your next month of posts. If you need to change your payment details, you can do so by clicking on 'Blog packages' in the navigation, followed by 'edit' under the billing tab. A blog package can be paused at any time by simply toggling the status from the "Blog Packages" section. While a package is paused, you will not be billed. You can then activate the package again at any time and your subscription will start again within 24 hours. If you are using the WordPress plugin, you can set posts to go live automatically, as soon as they are delivered to you. On the Edit package page, check the box marked 'Auto-publish'. Requires Copify WordPress Plugin version 1.0.4 or above. Our blog packages can be tailored to your exact requirements in terms of post length and frequency of posts. To create a custom package, navigate to Blog Packages » Advanced. 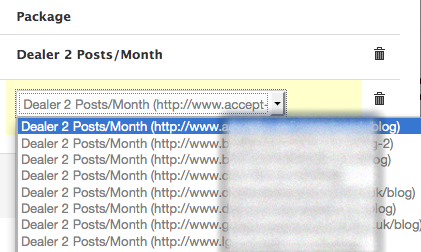 Under 'Custom blog package plans' click add. Give your package a name, and select the number of posts per week and desired word count - the system will give you a monthly cost (including VAT if applicable). Once you have done this, you can use the new custom plan on existing and newly created blog packages, simply select it from the dropdown list. Blog package customers can specify topics and titles for their blog posts by visiting Blog Packages > Advanced > Manage custom topics. 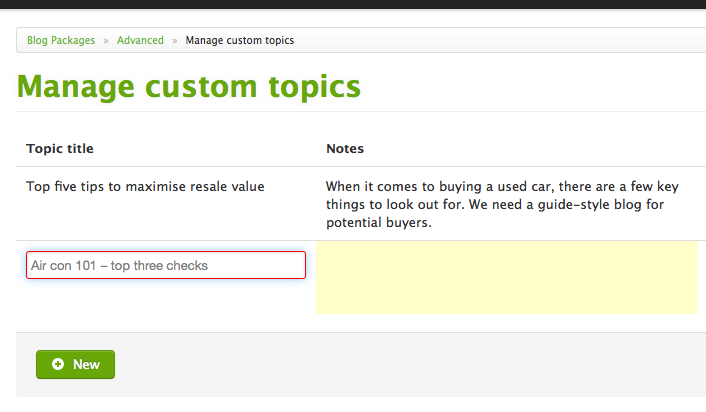 To add a custom topic or title, click ‘New’ and edit the ‘Topic title’ and ‘Notes’ text fields which will update the order title and brief for one of your scheduled orders. If you have more than one package on your account, be sure to select the correct package from the ‘package’ dropdown on the right hand side. Our blog packages can easily be resold to add value to your existing product or service, not to mention an additional revenue stream. Internet marketing agencies, for example, can ensure that clients have regular content added to their site, driving long tail traffic and increasing opportunities for internal linking. Users can create an unlimited number of blog packages on their account and can white label the service to create a seamless experience for their clients. 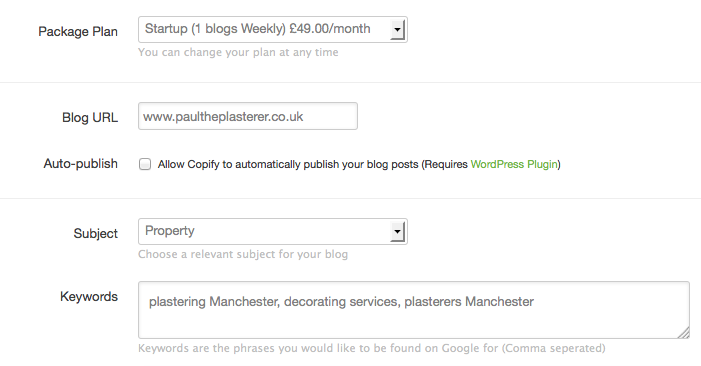 For agencies or other organisations with clients running a WordPress blog, our packages can be white labelled. This is particularly relevant to those who are interested in reselling our services, without their end-user client having any visibility of our involvement. Resellers can create a package on the client's behalf through the Copify interface and then installing a custom, white label WordPress plugin on their site. Navigate to Blog Packages » Advanced and add a "Custom WordPress Install". On the following page give your custom plugin a name, and choose the relevant package from the list. You can create an unlimited number of custom WordPress plugins on your account. Each custom plugin relates to a blog package on your account. Simply download, unzip, and upload to your client's WordPress install. Once the plugin has been installed, the client will begin to see their posts appear. They can publish new posts with one click, or you can set each post to go live automatically (see Auto Publish above). 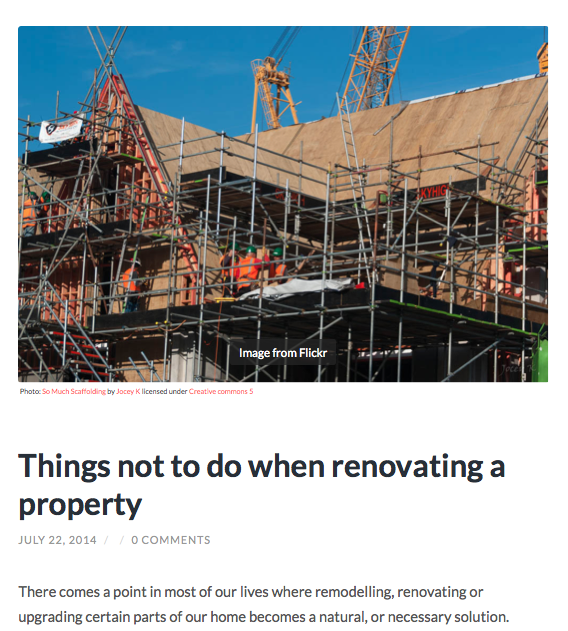 All blog posts are supplied with a royalty-free photo and the correct creative commons attribution to do so, for both personal and commercial use. Blog packages that have Auto-publish enabled, can also be integrated with Twitter. To set up, ensure "Auto-publish" is enabled, then visit Blog Packages » Advanced » Social sharing. Click the "Connect Twitter account" button, and confirm you would like to authorise Copify to send tweets on your behalf. Once this has been successfully set up, all new blog posts will be shared via Twitter. E.g.